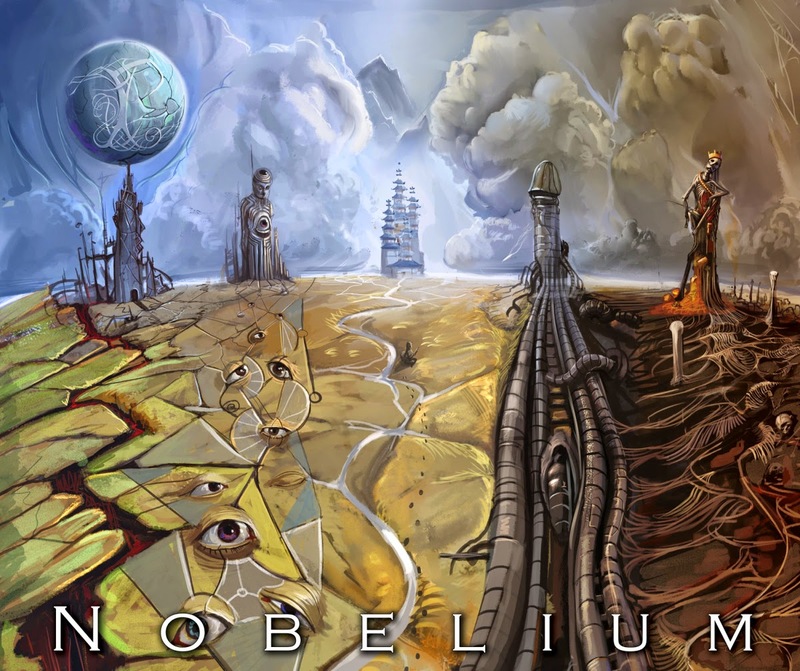 Infinite Art Tournament: Element of the Month: Nobelium! We are told so often that our lives are being rapidly transformed by technology that it is hard not to believe it, even though it is preposterous. A few centuries after our recent ancestors endured the shift from subsistence farming to urban industrial labor, not so many decades after people who had walked to the Pacific on wagon trains flew back East on commercial airliners, we have the stones to say our lives have been radically transformed because our televisions are very large and our gadgets are very small, and we have learned to use spreadsheets. Big whup. To a technophile visiting our time from 1966, the year that Nobelium was first synthesized, the utility of our pocket gadgets would be obvious, but the conspicuous absence of universal personal aviation, interplanetary travel, and safe and sanitary living conditions for a majority of humanity would be a real disappointment. After all, in the 49 years from 1917 to 1966, ways of life changed a lot! From 1966 to 2016, not so much. This is not because technology stops changing -- technology plugs along, obviously -- but because there is an effect of diminishing returns. Once railroads reduced travel times to almost nothing, making travel across nations possible and weaving city and country into a single social fabric, any subsequent acceleration up to and including teleportation is really just icing on the cake. Information transfer by computer is really something, and the internet is indeed quite an almanac, but in terms of social impact it's pretty hard to compete with telegraphy and telephony or, say, literacy. A physicist can put a life's work into producing a new atomic element -- probably right now somebody is going after Element 120 -- but proving the fleeting existence of a few volatile atoms forced into a new elemental shape is really only repeating the trick performed a half century ago by the Soviet, Swedish, and American teams who synthesized Nobelium. But again, despite that the social fabric of our lives -- the material condition of hearth and home, how we work, how we play, where we live -- has been hugely more stable than at any time since well before the founding of the United States, it is a challenge to see past the received wisdom, which would have it that our lives are as unstable as atoms of Nobelium with their half-lives of but a few dozen minutes. A friend of mine, who will perhaps read this paragraph, went so far as to say that the technology that revolutionized his lifestyle was -- a smartphone. When I asked him about the nature of the revolution, he said that he checks this phone all the time, even at dinner. Mind you, he has the same house, same job, same schedule, same interests, same pattern of social activity -- there has been, in fact, no change whatsoever in his lifestyle that is visible to an external viewer -- but he feels like his life has been revolutionized by technology, because he's now reading the news at the dinner table like a stereotypical 1960s father. Well. I daresay a typical citizen of 1915, adjusting to the replacement of horse-drawn plows and buggies with tractors and automobiles, perhaps sending their children for a high school education for the first time in family history, perhaps encountering a telephone, a machine that could transmit voices over long distances -- might find the difference between accessing the internet on a laptop and accessing the internet on a pocket telephone rather small potatoes. Part of this tendency to think of our own time as one of amazing technological progress is, I think, a dilation of history that allows us to think of past technological achievements as happening more or less "now." With our sophisticated smart phones and such, we figure, we can perform wonders such as synthesizing Element 102, and we can name it after the famous Swedish chemist and arms merchant Alfred Nobel! But as with most of the synthetic elements, the first creation of Nobelium is a thing from history. The people responsible were the age of my grandparents, and I am alas no spring chicken myself. 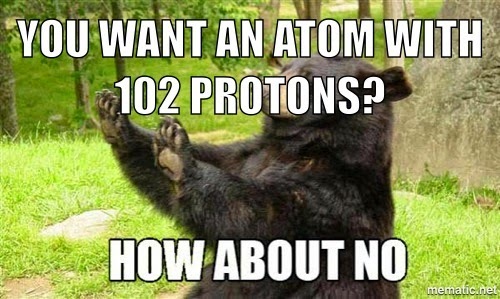 Occasionally, physicists still drum up a new synthetic element. That is the kind of thing that has been happening for the last fifty or sixty years. It is part of the landscape of our very stable technological age. For the record, I totally agreed with your point that people are being ridiculous when they say, "Life's changing so fast these days" when it's not compared to life in the early 1900s. (It even inspired a reading activity in the 1920s book I've been meaning to tell you about.) And my intention was not to imply, "Crazy! Due to this new machine I can now do this wacky thing called reading! Can you believe it?" Still, I will maintain that this is a significant change. Yes, I could have always carried around a book with me. But I didn't, and I now find myself checking my phone at dinner, whenever I'm waiting for someone, in my car before I go to the grocery store, occasionally while walking down the stairs... Much of my life looks the same, but to start a habit that I, and probably the majority of Americans, partake in possibly over 100 times a day is, if not life changing, at least life altering. No, this is not the industrial revolution. But I didn't expect it. There already was the internet; there already were magazines; there already were pocket phones; how different is this? But having that almanac always available with constantly changing content has proved more consuming than I anticipated. But anyway, that was so last year. And my New Year's resolution is to check my phone less. I'm one for one (at least at dinner)! Friend: But what does that have to do with Nobelium?